Last week, I made a rather distressing discovery. Brace yourself, because it’s pretty nasty. I have, it appears, been living in filth. Yes, filth. It’s shocking news, I’ll admit, but no-one was more astonished than I was. And what could have brought about such a revelation? Well, this harbinger of torment has a name. And its name is Dyson. Yes, I have purchased my very first Dyson vacuum cleaner. To be specific, I have purchased a Dyson Animal, in the hope that it will help me to clear up after my own animal, the adorable (but very orange and with a tendency to moult everywhere) Molly. Sure, it cost more than I got when I sold my old car, but it’s big and it’s shiny and I just had to have one. 2. 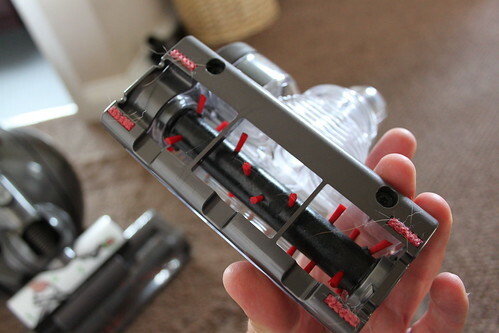 The cylinder on the Dyson was now almost FULL of dust, dirt and dog hair. In those few minutes, I realised that I was not the person I thought I was. I’d imagined that I was reasonably neat, tidy and kept a clean house. But no. I am living in filth. I am surrounded by detritus. My house is quite possibly being held together by cobwebs and dog slobber. Thank you, Dyson. By the time I’d hoovered the whole house (I could hardly stop now, could I? ), I had emptied the capacious cylinder on the Animal THREE times! And when I did the vacuuming again a couple of days later (the in-laws were about to arrive), I had to empty it twice more. And it was pretty much all – you’ve guessed it – orange dog hair. Perhaps I should have bought the brush attachment after all, to head this all off at the source. Here’s one of the attachments, which looks suspiciously like the thing that’s already on the Animal, but smaller. 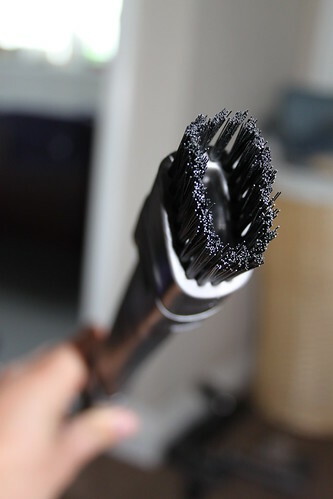 Check out the rotating bristles, which distinguish the Animal from its lesser Dyson brethren. Here’s one of the other attachments. It’s about two feet long, with the first bit made of plastic and the second bit made of flexible rubber. I daren’t even think about what this could be for. A very different kind of filth, possibly. 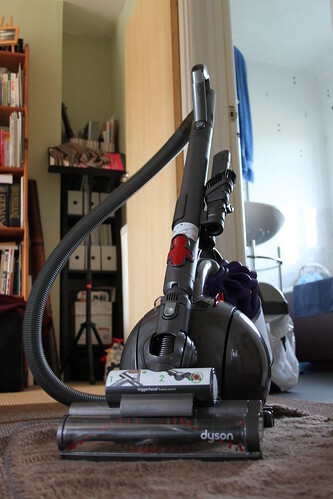 This entry was posted in Dogs, Family, Home, Photography and tagged Dogs, Dyson, Family, Home, Photography, Vacuum Cleaner by Simon Perks. Bookmark the permalink. I’m glad you liked my post. I think the dog is one step ahead of us, though, because as soon as I get the Dyson out, she races off to another part of the house. Clever Molly! She probably knows that if you get that Dyson on her, she’ll end up completely bald!